Way back in 1886, Karl Benz and Gottlieb Daimler revolutionised the concept of individual mobility, and Mercedes-Benz is still regarded as one of the world's most successful automotive brands. The image of quality, design and engineering excellence built-up during those 120 years is such that Mercedes-Benz vehicles are universally admired and much coveted. So it's always a special feeling to slip behind the wheel of a car bearing the three-pointed star, one of the most famous automotive symbols of quality and prestige. We re-lived that feeling recently, when we were privileged to spend a week behind the wheel of a new Mercedes-Benz C280 Avantgarde sedan, in this case further enhanced with the optional AMG 'sports package'. The previous model's comfort, style, outstanding safety and overall refinement won it many friends among 'upwardly mobile/aspirational' buyers, making it the most successful C-series of all time. But the new model sets new standards of dynamics and safety, enabling owners to "experience the road as never before", in Mercedes' own words. In the current economic climate, cars in the medium-sized 'prestige' market are increasingly affordable. Does this new offering from Mercedes have what it takes to further enhance Mercedes' market share? It certainly looks the part. Marginally bigger than its predecessor, the new C-series has a real 'presence' on the road, with sleek and elegant lines now combined with wider track to give a more sporty, muscular stance than before. Our only reservation is that the new frontal styling now more closely resembles that of many other cars on our roads. Gone are the prominent guards and distinctive 'peanut shell' lights which shouted 'Mercedes-Benz' loud and clear. 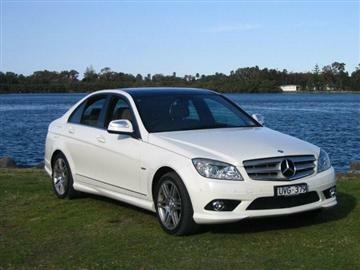 But that unmistakable Mercedes grille has returned to a more upright and traditional look. Overall, there can be no denying that this is one stylish car, outside and in! The slightly larger dimensions mean increased front elbow and shoulder room, together with more legroom in the rear, so driver and passengers are very well looked after. Our test car, beautifully trimmed in 'cashmere beige' leather, had the optional AMG sports seats, which offer great support for driver and front passenger. Our only niggle is that smaller Benzes like the A/B/C-series all come with a curiously offset driving position. In this model the driver's seat is some 25 mm off line with the steering wheel and the effect is enhanced with such snug, supportive seats. Adding new meaning to the old 'engineered like no other car' motto, it's a feature which can take some getting used to! Mercedes' top line, the Avantgarde line, denotes a comprehensive equipment level, and occupants will not be disappointed with the creature comforts on offer. Standard features on our test vehicle were exhaustive, but highlights included dual-zone climate control air-conditioning and 'active' cruise control which utilises the brakes on descents to ensure that speeding fines should be a distant memory. Other nice touches are heated front seats with electronic adjustment incorporating three memory settings and heated exterior mirrors (driver's with auto-dimming and memory). The 'Comand APS' multimedia system (standard on the C280 and C320), includes voice recognition for all key functions and integrates audio, telephone and navigation functions with a DVD player which can be activated below 5 km/h. A little complex initially, when mastered it means that hands never need to leave the wheel. The 'parktronic' distance sensors, with both visual and audible warning for front and rear, make parking an absolute breeze, while the optional panoramic glass sunroof rates special mention. It features a key-activated 'summer opening' function to quickly release heat when you return to the parked car. 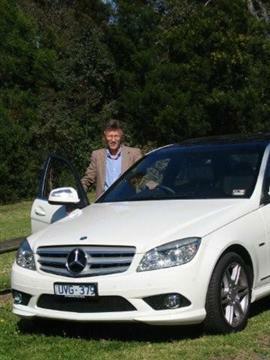 Truly, Mercedes-Benz left almost no stone unturned with this particular vehicle! Safety is paramount with Mercedes-Benz and this model features 'Pro-safe', which integrates a full range of passive and pro-active safety measures, ranging from tyre pressure sensors to BAS and ESP (now recalibrated to allow for a touch of over steer, for keen drivers). Naturally, a full complement of driver and passenger airbags is provided, including one for the driver's knees. The optional intelligent lighting system includes adaptive low beam headlights and a cornering function which follows steering movement. Handling, braking and ride comfort are all top-rate, even if steering feel is not quite up there. But it's still fine. Oh, did we forget to mention performance? Well, the silky smooth 3.0 litre V6 develops 170 kW @ 6,000 rpm and 300 Nm of torque @ 2,500-5,000 rpm, and combined with the superb 7-speed automatic transmission, delivers plenty. A quoted top speed of 244 km/h and a 0-100 km/h time of 7.2 seconds, are yours for the asking, if ever required. And all this with modest fuel consumption (combined cycle) of 9.6L/100km, which we managed to equal during our test. It does, however, require PULP (95RON). Importantly, it's the first vehicle in this market segment to be awarded ISO-Norm 14062 certification for its environmental credentials in the areas of fuel consumption, vehicle emissions and choice of construction materials - ever more vital factors over a car's lifespan. The C280 Avantgarde is already a stylish car. 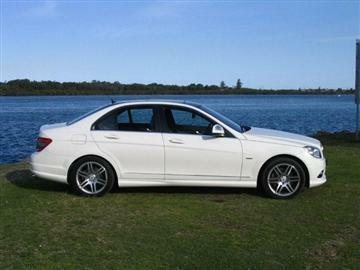 Enhanced by the AMG sports package (optional at $6,340 for the C280 Avantgarde) which includes distinctive 17-inch alloy wheels, sports body kit, sports seats and 3-spoke leather steering wheel with shift paddles, our test vehicle was a real head-turner. The Mercedes-Benz C280 Avantgarde is priced from $86,000 (RRP) without options and on-road costs, the Mercedes-Benz C280 Avantgarde is not inexpensive - nor are the many worthwhile options available - but if style, performance and safety are high priorities, then it's hard to overlook the three-pointed star. And the popularity of the new Mercedes-Benz C-Class proves that the buyers are already lining-up to take advantage of the treats on offer with this new model.